This Cloudflare Block provides dashboards to make analyzing Cloudflare logs easy and help you understand events and trends from your websites and applications on the Cloudflare network. Logs are gathered from all our 155+ data centers in near real-time and can be combined with other data sources, such as your origin data, to get unique insights and help you improve the performance and security of your websites and applications. 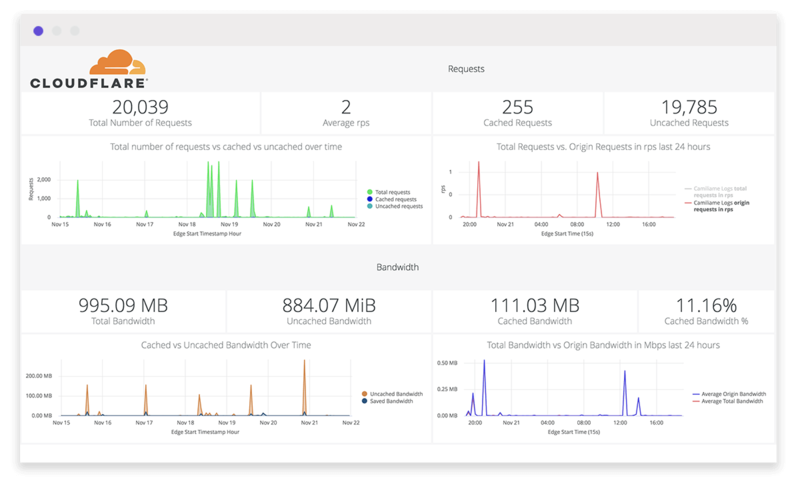 There are four dashboards to help you analyze Cloudflare logs. You can also use filters within the dashboards to help narrow the analysis by date and time, device type, country, user agent, client IP, hostname, etc., to further help with debugging and tracing. 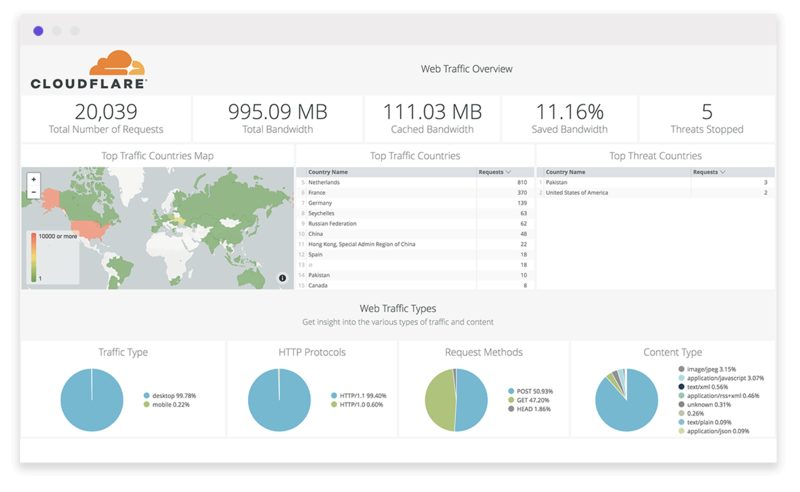 Snapshot helps you get a quick overview of the most important metrics from your Cloudflare logs, including total number of requests, top visitors by geography, IP, user agent, traffic type, total number of threats, and bandwidth usage. 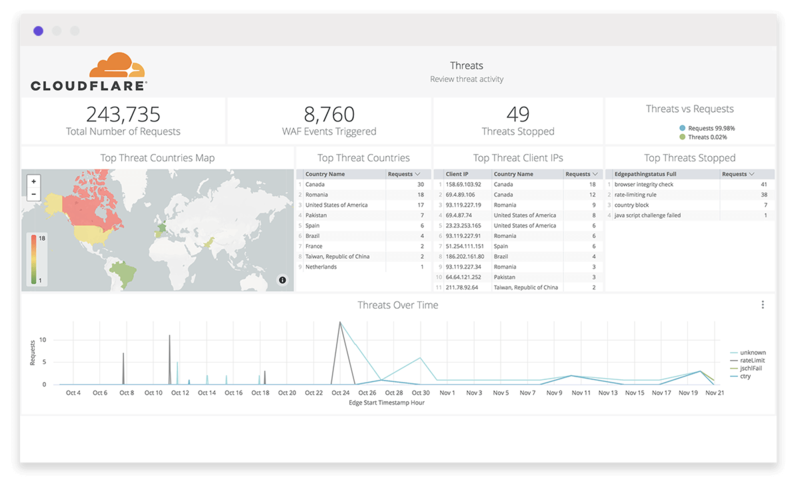 Security provides insights on threat identification and mitigation through our Web Application Firewall, Rate Limiting rules, and IP Firewall. Metrics include total threats stopped, threat traffic source, blocked IPs and user agents, top threat requests, WAF events (SQL injections, XSS, etc. ), and rate limiting. Use this data to fine tune the firewall to target obvious threats and prevent false positives. Performance helps you identify and address issues like slow pages and caching misconfigurations. Metrics include total vs. cached bandwidth, cache ratio, top uncached requests, static vs. dynamic content, slowest URIs, and more. Reliability provides insights on the availability of your websites and applications. 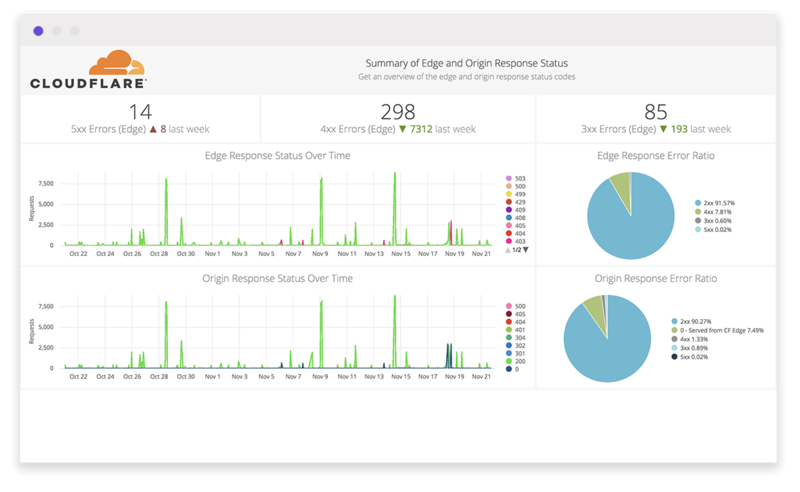 Metrics include origin response error ratio, origin response status over time, percentage of 3xx/4xx/5xx errors over time, and more.